A typical casino party lasts 3 hours. At the start of the casino night, your guests will be given a 1,000 chip that can be used at any of the casino party gaming tables. The dealers will exchange the 1,000 chip for smaller chips denominations of 10, 50, 100 and 500. Your guests will have lots of fun while trying to win as many chips as possible before the casino party ends. 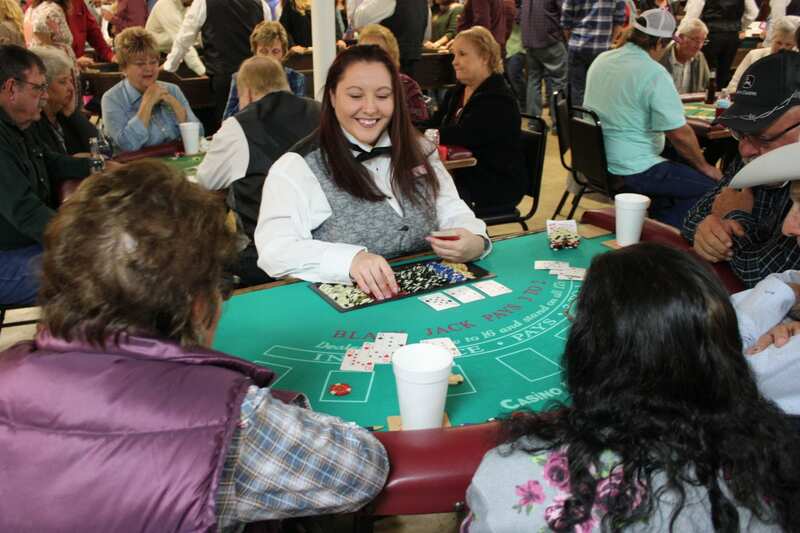 At the end of the casino night, your guests turn their chips into the dealer, who in turn gives them a voucher or raffle tickets which they can use for a giveaway or auction for the prizes provided by the host/hostess. Our friendly casino party dealers will teach any new players good basic strategy on all casino table games, and we deal to Vegas standard rules and odds. The number and type of casino party gaming tables that you will need for your event will be determined by you and our casino party planning staff. Typically we suggest enough casino party tables to accommodate about 60% of your guests to play at any given time. We offer all your favorite casino party games such as Blackjack, Roulette, Craps, Texas Hold'em, 3 Card Poker, Let it Ride Poker, Chuck a Luck and Slot Machines. Casino Fun Inc.'s party planning staff has over 18 years of experience planning everything from a 10-person home birthday party to a 2000 person corporate event. We can help make your casino party the most memorable event ever! Lots of casino party fun! We will teach all new players basic strategy on all casino tables. Learn and have fun! How much Casino Party Equipment do I need? If the casino is the main/only form of entertainment for your event, you will want to have enough gaming seats for 60-70% of your guests. If you have two or more forms of entertainment, you will want 30-40%. Each casino has a different number of total playing spots but on average, they accommodate 7-8 players. Do you provide the casino party dealers? Absolutely. We require our dealers to be present for all of our events. Our dealers are hired for a minimum of 3 hours. All of our casino party dealers are trained to deal Las Vegas standard rules and odds. We do not offer packages or equipment without trained dealers. How are your casino party dealers dressed? Our dealers are required wear black skirts or slacks, tuxedo shirt, vest and a bow tie. For summer events, red polo shirts are available upon request. How much space do I need for a casino night? That depends on the number and type of tables. Generally speaking, about 80 square feet for blackjack, roulette and poker and about 100 square feet for craps. This includes enough room for the table, dealers, players and walking area. Yes, casino parties are legal since there is no real gambling involved. Guests receive playing chips free at the door and have a chance to win non-cash raffle prizes at the end. Is there a minimum age requirement to play the casino night games? No, since there is no real gambling involved guests of any age can play. Should I tip the dealer and if so how much? Gratuity is not included in pricing, however, tips are very much appreciated. As with any service, tipping is based on your level of satisfaction. Typically, our quoted prices are for 3 hours of casino playing time. Longer parties may be arranged at additional cost. Are chairs provided for the casino party tables? Typically, the party host/hostess is responsible for providing chairs and generally, only the Texas hold'em tables require them. We can however, lower blackjack tables to sit down height at the client's request.